This 36-inch soundbar delivers true 5.1-channel surround sound, but you'll need to hear it to decide if Vizio made the right compromises in its effort to hit this price point. There’s simply no substitute for a surround-sound system with discrete speakers. The problem is, many consumers can’t tolerate the aesthetic compromises or setup hassle that can come with it. While traditional soundbars are pleasing to the eye and simple to configure, they just can’t recreate the audio magic that discrete speakers can deliver. 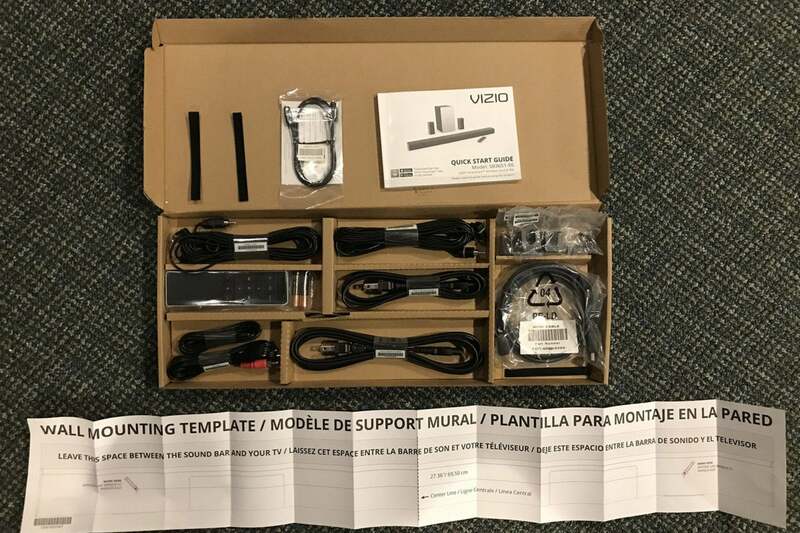 That’s where Vizio’s 5.1 Smart Cast Sound Bar System comes (look for model number SB3651-E6, which is how I'll describe it from here). This system consists of a 36-inch soundbar; a compact, wireless subwoofer; and two satellite surround speakers. Audio voodoo need not apply. The slim, low-profile SB3651-E6 is is the perfect complement to TVs of all sizes. The main speaker is a sealed design, as opposed to some competitors that are ported for deeper bass response. 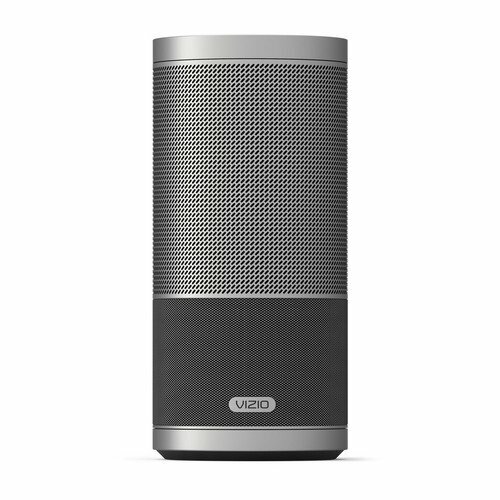 Vizio leaves low-frequency duty to the included wireless subwoofer. The main speaker in Vizio's SB3651-E6 Sound Bar System is a sealed cabinet measuring 36 inches wide. 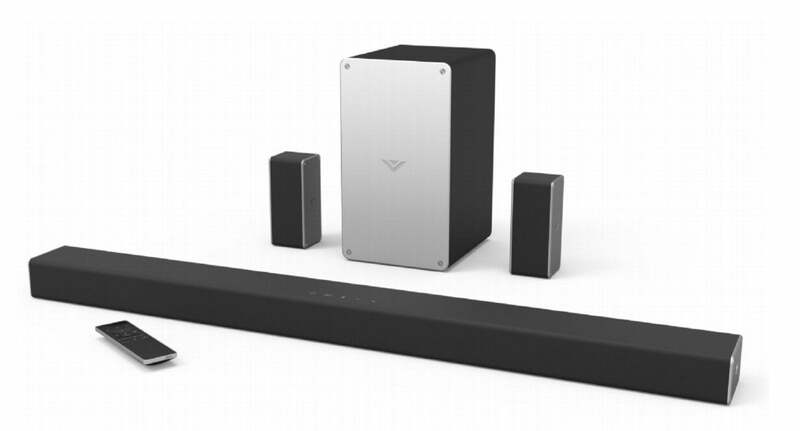 The tall, rectangular, wireless sub is a rear-firing, rear-ported design that Vizio says is capable of frequency response down to the 30Hz range. As such, it does yeoman’s work with most special effects, but you won’t get anywhere close to the full impact of explosions, depth charges, and subterranean bass. Physics is still physics. 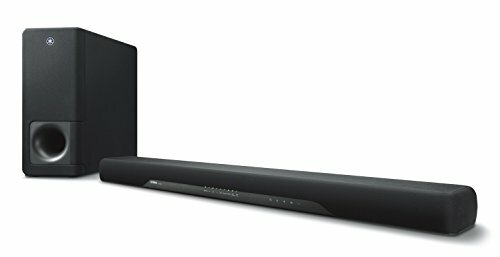 With the sole exception of DTS: VirtualX on the Yamaha YAS-207 soundbar, artificial surround processing on soundbars has left me underwhelmed. The SB3651-E6 doesn’t try to use DSP or artificial processing to simulate a surround-sound experience. Instead, a pair of dedicated speakers handle side-surround duties. The speakers are small enough to pass inspection from most spouses, but they'll raise eyebrows from home theater purists. The surround speakers plug into the subwoofer with very long long speaker wires terminating with RCA connectors. While that makes connecting the speakers a piece of cake, you’re limited to how far away from the sub you can connect the speakers. For that reason, you’ll notice Vizio recommending the ideal placement of the subwoofer being near your seating position, as opposed to a corner, which will boost bass output. So long as your room isn’t extremely large, you won’t run into any problems with placement or cable length. 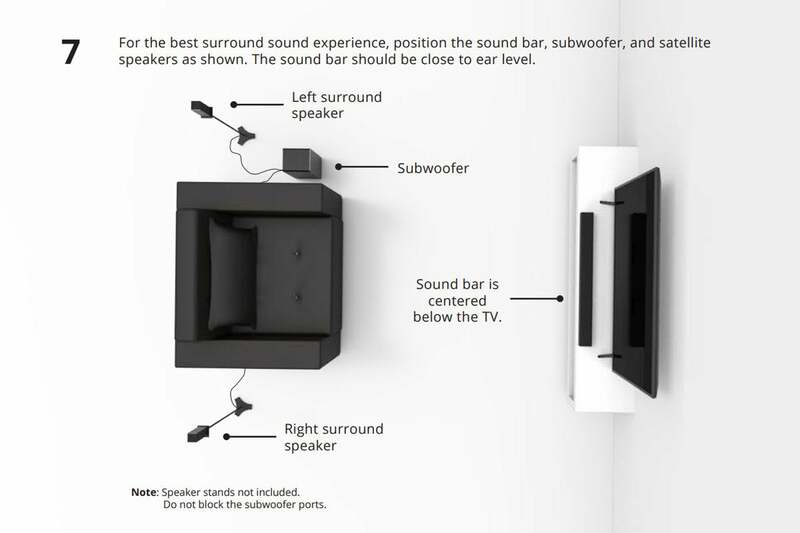 The surround speakers must be hardwired to the subwoofer, so Vizio recommends placing the sub near your seating area. It’s worth noting that there’s no on-board EQ or phase adjustments to help dial in the subwoofer to your room’s acoustics. Such features are few and far between when you're shopping in the sub-$300 range. Vizio’s SB3651-E6 has the best set of accessories I’ve yet seen in a soundbar, including just about every cable you’ll need: HDMI, Toslink optical, RCA analog, 3.5mm-to-3.5mm for mobile devices, and 3.5mm-to-RCA phono are all included. You even get small pre-cut Velcro straps to help you tidy up your cables after installation. Most manufacturers provide identical power cords for the sub woofer and soundbar. Not so here. You get two power cords of different lengths: One is 103 inches long and the other is 63 inches long. That’s smart. You're more likely to have an electrical outlet near the soundbar than the subwoofer, so you won't need to worry about reaching an outlet for the sub, and you'll have less cable to coil up behind the soundbar. The top of the sound bar has basic, functional buttons. Whoever is in charge of industrial design at Vizio paid attention to seemingly every detail. Vizio gets high marks for making the consumer experience easy and intuitive. For example, there are labels over the soundbar’s inputs informing you to download the mobile app first before you set it up. An excellent note on the HDMI port explains that you need to activate the CEC feature on the TV (assuming your TV supports it) for the HDMI audio return channel (ARC) to work. HDMI ARC allows your TV to pass audio back to the soundbar over the same HDMI cable. I always make note of this in our reviews, but this is the first time I’ve seen a manufacturer go the extra step to help avoid any potential frustration. I tip my hat to the Vizio team. The included remote has a small display, but you can't read it in the dark. 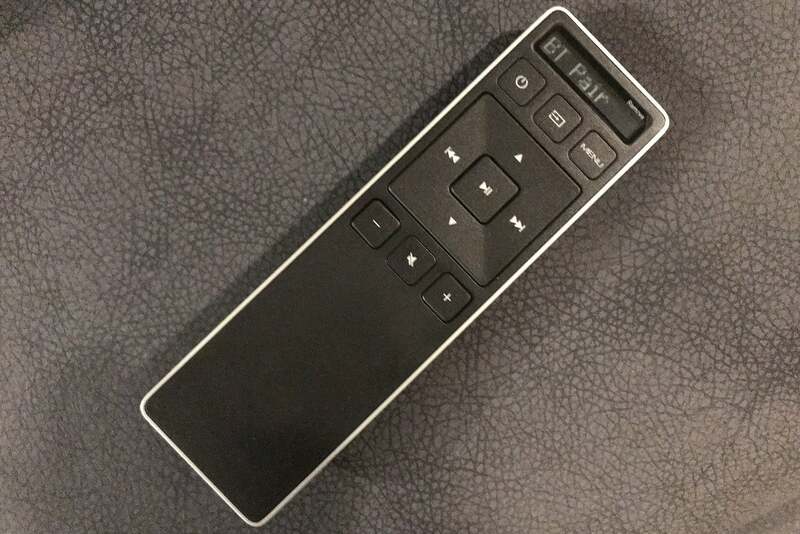 Just about every soundbar I've reviewed that sells for less than $300 has come with a cheap remote control, and it stinks. Vizio's remote is the best I’ve seen with a soundbar at this price point. It’s sleek, well designed, intelligently laid out, and it delivered outstanding range in my home theater. Vizio could make this remote even better by making the white lettering and symbols larger and more pronounced. As it stands, you'll need very good lighting to see what is on each button. A small LCD displays the input or volume, which is essential because the soundbar has only a few lights on its left-hand side to indicate what it's doing at any given time.Unfortunately, the LCD uses almost yellow-green text on a black background and isn’t always clear. And because it's not backlit, the display is useless in the dark. If you memorize what each button does, you can learn to navigate it by touch. 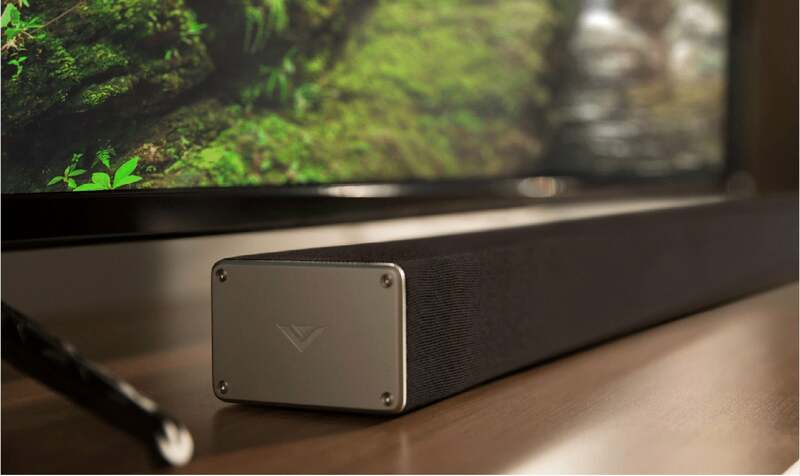 The Vizio soundbar pairs easily with the SmartCast app and has rich integration with streaming content. As good as the physical remote is, Vizio's feature-rich SmartCast mobile app is even better. Here again, it's the best I've seen accompanying a product in this price range, and it's better than the apps that come with many more-expensive speakers. 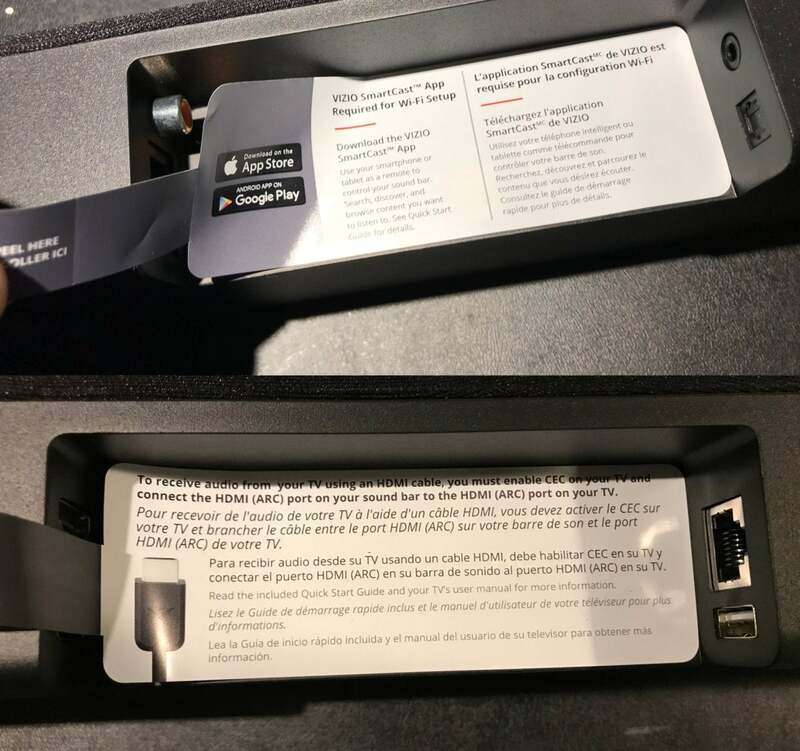 Vizio has made a strong commitment to Google’s Chromecast technology and this app works across Vizio's entire produce line, from TVs to speakers. 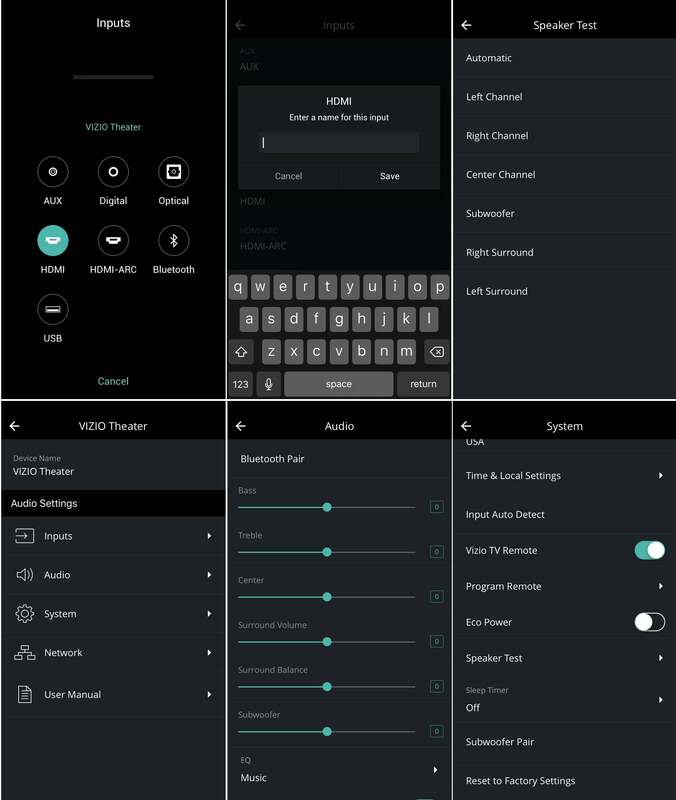 If you're all in with Vizio from an entertainment perspective, the app is a unified control mechanism for your Vizio TV, your Vizio soundbar, and your portable battery-powered Vizio speakers (such as the Vizio SmartCast Crave 360). The app lets you do much more than just adjust the volume and switch inputs, you can even re-name individual inputs so they appear as Blu-ray, Cable, Apple TV, or ChromeCast instead of HDMI, AUX, Optical, and so on. Vizio's SmartCast mobile app gives you extensive control and customization of the soundbar's audio features. I was thoroughly impressed with all the different things I could do to fine-tune my audio setup. I could adjust treble and bass, adjust center-channel and surround-speaker volume. I even had options for altering surround balance, subwoofer volume, and different EQ pre-sets. The app gave me the option of identifying each speaker to confirm that my setup was correct, too. I only wish Vizio had included a pink noise option to level-match the individual speaker volumes. For those of you who want to really geek out, I recommend using the free THX Tune-up app available for iOS and Android. It will help you dial in the SB3651-E6 (or any audio system for that matter) quickly and without any additional measurement tools. Like every soundbar I’ve tested, I set up the Vizio SB3651-E6 in my basement home theater, where I have a dedicated Dolby Atmos and DTS:X 7.2.6 object-based audio setup anchored by SVS Ultra speakers and SB13-Ultra subwoofers. I placed the Vizio SB3651-E6 on a table directly above the SVS Ultra center channel and the surrounds directly on top of the SVS Ultra bookshelf speakers that handle surround duty. The Vizio surround speakers were approximately two feet behind my primary listening position. The sound bar's back has perfectly placed stickers giving users clear instructions. I fired up Star Wars: Rogue One to give the Vizio system a workout, which revealed the soundbar system's strengths and weaknesses. Chief among its strengths is the fact that it creates a true surround-sound experience. The rear side surrounds do their job. I did find the surrounds to be far too aggressive with their default settings; however,. I had to tame their volume down to balance things out. Secondly, dialog was clean and intelligible. It appears as though this has been fine tuned by design. Unfortunately there is slightly thin and boxy quality to the sound. To be fair, that’s not uncommon at this price point. I have a large, open space, so I needed to crank the volume up a bit. The soundbar had some trouble keeping up. As I raised the volume louder, I noted some audible harshness. The sub was the weak link in the chain. It tried its best, but had some trouble with certain scenes. Trying to recreate the Death Star’s destruction of the city of Jedha at the opening of Chapter 19 brought the sub to its knees. Likewise when the X-Wing fighters attack the Imperial facility on Eadu in Chapter 25, the woofer was vibrating so violently during explosions that I heard audible distortion and chuffing from the sub’s port. The subwoofer will give you a sense of some low-end impact, but it just doesn’t have the power and finesse larger subs do. Scenes with lots of low-end dynamics will give it a challenge. The Vizio comes with an exhaustive set of accessories. Vizio’s SB3651-E6 offers a lot of bang for the buck. The SmartCast app is fantastic, the physical remote is better than most at this price, and Vizio provides all the accessories you'll need. The individual surround speakers give you an authentic surround experience with a tiny footprint, and the main soundbar delivers highly intelligible dialog. But that bang has some trade-offs. The Vizio will struggle at high volumes and the sub will face stiff challenges with dynamic, low-end content; fortunately, none of those shortcomings are enough to derail the whole package at this price. Vizio’s SB3651-E6 is a low-priced, entry-level system for consumers who prize high-tech features and want a genuine surround-sound experience with the smallest possible footprint. Correction: This review originally reported that the infrared remote control that comes with the SB3651-E6 was a Bluetooth model. Vizio delivers true 5.1-channel surround sound in a streamlined footprint and at a very low price point.